Melanie Irwin’s practice merges sculpture and drawing with performance art. Performers physically interact with objects and materials in works that address the body’s negotiation of geometric space. Irwin’s Appendages series replicated one of the artist’s regular activities – carrying around materials to use in her practice. 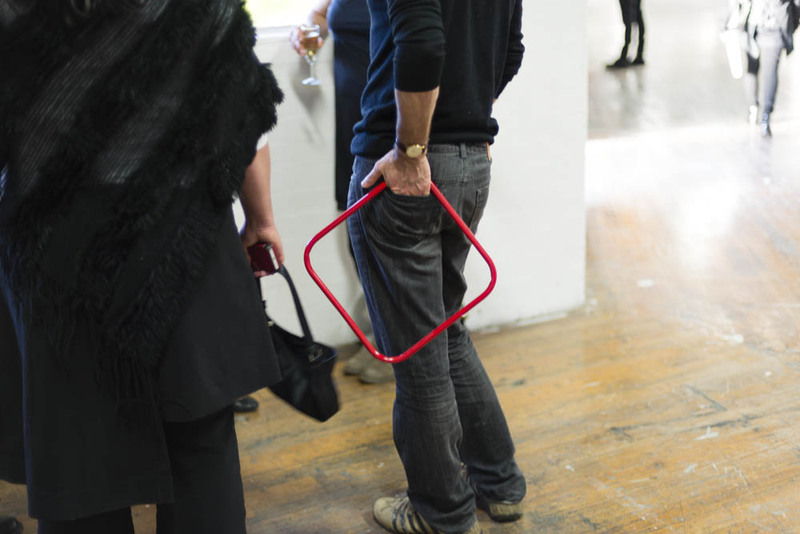 She tasked around fifty participants with bringing a metal geometric shape she had given them to an exhibition opening. They were instructed to carry the shape around and take it with them when they left. The artist had extracted these metal hoops and rectangular frames from discarded household items, such as chairs, stools and hose reels. They were then powder-coated in primary colours, which unified them as though elements of a large drawing. The elements relied on participants to converge at the event in order to see the work in its complete state. Irwin staged her Appendages series to involve the gallery-going audience in the actual making of the work. In this way, she encouraged their appreciation of the broader possibilities of performance. Irwin’s Spherical Approximations involved a series of performances in which performers inhabited large stretchy textile membranes. The performers were instructed to stretch the membranes into perfectly spherical forms – an impossible task. Using the metal frames and rods provided in the space, they built makeshift structures that expanded and contracted over a duration of two or three hours. The performers remained inside the membranes for the entire performance, working without an objective perspective. By doing so, the project located the sculptor inside the sculpture. This resulted in spiky, asymmetrical entities that wandered around the gallery space, ingesting objects and evoking a comical kind of pathos. The work celebrated the human body’s capacity for elasticity in response to demanding and constrictive circumstances. In her practice, Irwin uses the body as her sculptural material. The performer is the work itself. In this way, she reminds us of the body’s adaptability, functionality and aesthetic worth.